Stand-in skipper Cole Skuse insists he and his team-mates remain confident in themselves and believe things will turn. Following Saturday’s last-gasp 1-0 home defeat to Sheffield Wednesday, the bottom-of-the-table Blues are now eight points plus goal difference from safety with 16 matches left to play. 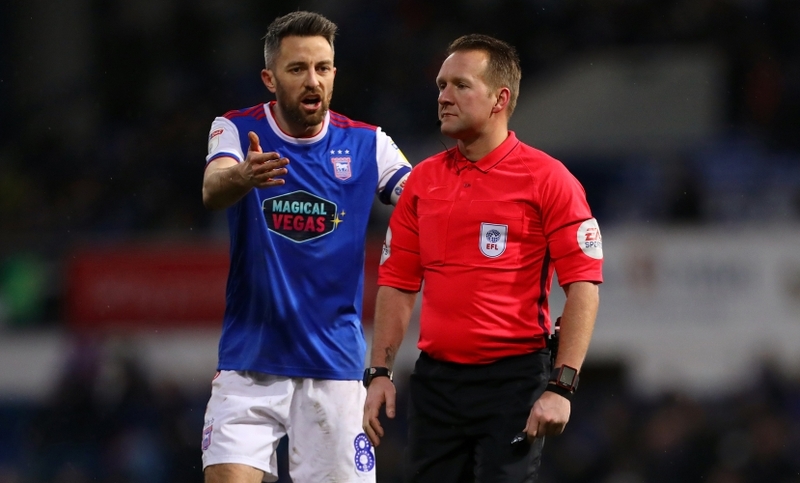 Skuse, who wore the armband in the absence of injured captain Luke Chambers, felt Town were better in the second period than they had been in the first against the Owls. “At half-time we held our hands up and had to admit we weren’t at the races in the first half,” the Bristolian said. “We got on the ball more in the second half but it was a real kick in the teeth to concede that late goal. That was a tough one to take. The midfielder, 32, says the players know they need to start picking up points very soon if they are to prevent Town from dropping into the third tier for the first time in 62 years. “You won’t find a more honest group of lads than what we’ve got here,” he added. “We’re up for the fight and we can only keep going but we know we need to start picking up points. The Blues were without both Chambers and fellow centre-half James Collins on Saturday, due to foot and hamstring injuries respectively, with manager Paul Lambert hopeful they’ll both be fit for the East Anglian derby at Norwich City on Sunday. “They were two huge losses but Matthew Pennington and Toto Nsiala defended well. Totes was a colossus,” Skuse added. Sub Lucas Joao scored the goal which saw Wednesday to victory in new manager Steve Bruce’s first game in charge. “Of course I’m happy to score but the main thing is the three points,” the Portuguese frontman, who also scored both goals as Wednesday beat Town 2-1 at Hillsborough earlier in the season, said afterwards. “It is all about helping the team. If I start I want to score and if I come off the bench it’s the same. “It was a great bit of play by Reachy [Adam Reach] and I was in the right place at the right time when he cut the ball back for me. In my position I have to score goals. It is my job. “This is just the beginning. We want to build something big. He is the first English manager I have had at the club and I will give everything. Meanwhile, Town’s table-topping U23s are in action against their Crystal Palace counterparts at the Eagles’ training ground this afternoon (KO 1pm). How can he say as we sit rock bottom that they held their hands up at half time and said they weren't at the races... Pathetic. it shows they do not care about the club as much as we do. Sadly there isnt enough time. I don't believe it will turn. Mate of mine after the Wednesday game said he'd be happy if we only lose 1-0 at Norwich as he's expecting yet another humiliation. When fans are happy with losing small rather than getting thrashed it's a really bad sign. If we somehow got 0-0 though, I'd be first-pumping. That's how low my own expectations are. We have a dodgy defence that loves passing across the back, a light-weight midfield who fail to ease pressure or create chances and strikers who can't put the ball in the back of the net. Total recall needed in the Summer. Whole team is a total disaster. No talent , no confidence = no hope. Time for a total overhaul as we need to just accept that we a relegated. We need to focus on who will be playing for us in league 1 next season and try to build a team who play for the club and each other. Give the under 23's some game time as they will be essential for us in the seasons to come and to be honest can they do any worse than the offal we are putting on the field now?????. Sorry but these words are used too often and are hollow. I have no doubt that good intentions are in the words but collectively as a squad there is nowhere near enough talent in the boots. The likes of Leeds , Norwich and Sheffield Utd have been in league 1 over recent seasons and are now doing well. I have accepted that we are going down. Let’s get it over and done with, sort the men from the boys and re-build and re-structure. Personally deep down lambert and Evans realise that as well. I do appreciate that we aren’t mathematically down, but let’s be honest. Can we all see where our next point let alone win and survival are coming from. We can’t defend or score for toffee. For a team that’s “so together”, every game lacks evidence that we can play that way. No creation, no support in going forward, midfield sitting so much - getting in each other’s way. I’d start with an obvious 442 and put Sears playing up with Keane, playing as close to each other as our midfield like to do. That will naturally free up space in midfield as it will push and opposition defender back too, and in return give Judge and Bishop more room to create - Hurst started this formation that can be played negative - get rid. The team need to win 3 in a row just to make things interesting. The same team which has only won 3 times since Hurst took over in October. No turning round this sinking ship; Iceberg ahead which we can see from a distance but no-one has the energy to steer the ship clear of disaster. We haven't got the players or the characters to dig us out of this mess. I'm worried already for next season, with very good reason. For me on Saturday we sadly lacked a leader on the pitch. This needs sorting out as Chambers won’t be available for every game and moving forward into next season, will he even be here? Rubbish. It needed to turn ages ago. Our fate is sealed all but mathematically. I suppose we will get the same old clap trap until the end of the season. Personally, I think we will struggle in league one with this squad. Poor times ahead. I hope I am wrong. Do think that a few more of our own youngsters need to be blooded now. Same old tosh every week .Sleepwalking into oblivion .Loan players no better than what we have . Yeah , I think they will turn , one day, just wondering if I will still be alive to see it. Deluded, same old rubbish comes out after each defeat bit nothing changes, we are unfortunately doomed. More verbal diarrhoea. Just bore off skuse. Yawn yawn yawn. What a load of garbage, al I heard from that article was blag blah blah. I swear to god half of it sounded like McCarthy talking. You weren't at the races in the first half?? We need the players to try and stay positive and we need to try and stay positive with them but they really do need to be feeding us more than a few crumbs. Lambert said everything he could to raise morale but unfortunately performances haven't translated on to the pitch. He seems to get it but can't quite execute it on the pitch which is a worry. I'm still on board with him but he really does need to consider playing 2 up top. Hurst was stubborn on that front and look where that got him. I was no big fan of McCarthy but remember how well we started last season when he was playing Waghorn, Garnder and DmG all up front at the start of the season. Ok it all went off the rails but it was nice while it lasted. We were 2nd in the league briefly, that's what happens when you play nice attacking football. Mick had his moments but then he would go back to default settings and put 2 defensie midfielders in and that killed it for me. But then since Mick we've had Hurst pack the midfield with 2 defensive midfielders and even Lambert seems to like a bit of that too! Not looking forward to next Sunday! All we can hope is Norwich are too over confident and we manage to take them by surprise but seems a very tall order indeed! How many more times will we hear this rubbish . You're in denial mate , look at the table . The team lacks passion and you are a prime example - where was your leadership as skipper on Saturday . A team that can't score goals and is always likely to concede , is in it's right position . If we're going to turn things around, we need the sort of turn like a fighter jet pulling 9G, our turn around is equivelent to a 40T truck turning in a tight depot and now has broken down! We were down before Lambert arrived. 3 wins, 2 of those by sheer luck. To achieve 46 points we need to average 1.75 points per game. We have absolutely no chance. I’m just glad I was there cup final 78, Uefa Cup 81 and both promotions to the premiership. Something tells me it will be a long time before we have anything to celebrate in the future.